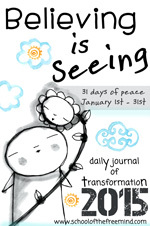 [28 days ’till Daily Peace] Several students that I’ve worked with regularly over this last year are aspiring children’s book makers and yet our first time working with each other came through the Believing is Seeing e-course. Because of how I approach children’s books, working with peace and how we think is a perfect foundation to begin with. I’ve found it profound to watch artist/authors grow deeper into themselves and the strength of their creative expression. Cynthia has inspired me no end inside and outside. My own creative power is strengthened through my experience with her and I feel honored to share in this creative cycling. Here we go! Maya: Weclome Cynthia! You and I have been working closely together for the last year now. 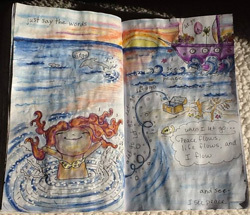 We met in Mira’s Hero’s Art Journey and since then you’ve taken two sessions of The Heart of It course for children’s books as well as Believing is Seeing. So much of this work has to do with transforming your thinking and approaching things in a different way no matter what you’re creating. I’m curious if you sense a shift in your thinking and if so how that may be affecting your creativity? Cynthia: Hero’s Art Journey was my first experience with you and your work. When I saw you light a candle and the focus of the camera was on your hands working, I knew this was someone I needed to work with. I say needed because there was something that resonated so deeply in the approach. It was an approach from the heart and the heart connection was what I was seeking. I didn’t even realize how much I was seeking this energy until I watched the art process you use. Since taking online courses from you, beginning with Believing Is Seeing, I see my art and writing differently. I have always believed my creative force comes from Source Energy, but to witness and feel this with a conscience and present energy has deepened my work. I have definitely seen a shift in my thinking from the “old me.” The old me, used to believe that I needed to push myself and stay disciplined to accomplish and successfully produce something of value. The new me sees how I can peacefully create instead of produce. 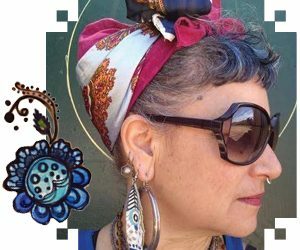 I try to focus on creating with ease and thus connecting to my heart and allowing Source Energy to flow from me effortlessly. Some of my biggest shifts in my thinking are to look closely at how I and we see and believe something truly is. I’m talking about how I see myself, my beliefs, and my reaction to the world, and how we as a people see each other. These are very big concepts to soak up, but they are the very core of what we are as humans all sharing the same planet. How do we represent each other in our work and how do we INCLUDE each other in our work. Your work focuses largely on inclusive writing and art. This is the stuff that makes us unite! This unity is powerful beyond what we have been existing with and I’m excited to be a part of it. Maya: Believing is Seeing includes a lot of art prompts and playful creative exploration and expression, I’m curious if that’s had any impact on your children’s books directly or indirectly? Cynthia: Working in the Believing Is Seeing workbook [I See Peace Book & Journal] gave me the space to “play.” This very concept of “play” is at the core of your work. It is an energy and action that allows Source Energy or the Creative Force to flow from us. This is the energy that allows the heart connection that we all feel whether we are aware of it or not. It’s what drives us as humans and our interactions with each other. It’s the stuff of Light that allows us to connect and create. It has been almost a year since I took the Believing Is Seeing online course and today I still am reminded to allow myself to come from a place of peace, for peace is at my very core. I am so much more magic and so much larger than I had been living. I am still working on this concept of expansion and need to remind myself often, but no matter what occurs, I am peace. I see peace. Maya: Developing and creating an entire children’s books is a large endeavor with much to learn, have you noticed peace with you? 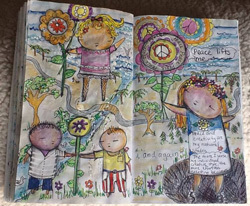 Is peace a part of your children’s book process? How does peace affect what you create? Cynthia: Doing the Believing Is Seeing course gave me wings! I can fly around peace and know that it is my foundation and building blocks to create the runway and take flight and soar into limitless possibilities. Peace is always at the core of what I create. I think about how am feeling when I am creating and how can I translate that energy to my work, so that it can take flight and be received by others. I also think about how someone will feel when they see or read my work. Does it reflect or give them the peace we all desire? Peace is always present for all of us and to take a conscious approach to peace, gives my work the energy of peace. Peace allows me to trust my hands and their creative force. Maya: You are on the verge of going into final drawings and arte for your first children’s book, what creativity/peace wisdom do you have to share as you approach this milestone? Cynthia: Creating a book is a process and a milestone that has been coming for a very long time. With internal and external creating, I have given myself the space to create something. The concept of space translates to everything in my life. Do I give space for freedom, space for joy, space for grief, space for love, space for change? Without space I cannot create. Each of us is called forth to create and change the space we exist within. 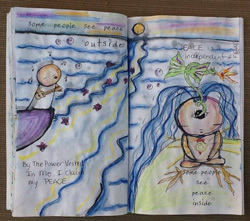 I have been called forth to create a children’s book with the hope to change space. Cynthia: If I was to ask myself anything, it would be how do I see myself changing. When I look back on the body of work I have created, each one tells a story about me and where I was at the moment I created that piece of work. I have memories within each piece that is like a journal. It is somewhat a timeline of me and where I have been and even has the seeds planted to what will grow with my future work. My work is ever changing as I change and become aware of my beliefs. Change and awareness are a goal, for without it, I will be the same and create the same work. This practice of creating art is a reflection of my life that is to be ever changing. Maya: Oh Cynthia! I feel like I’ve gone on a journey just listening to your words. Thank you so much. May the peace continue!